If you're looking for a cookie that's delicious and healthy, why not try this oatmeal granola cookies recipe. These cookies are chock full of fruit, nuts and oatmeal. For the perfect combination of flavors. my Oatmeal Granola Cookies are sure to please! Wouldn’t your family love to snack on these for dessert tonight? 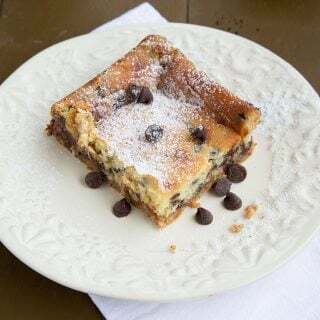 When we got this months recipe swap, things changed up a bit, first of all, we went to a new cookbook for this new year, and our first challenge would be a cookie. 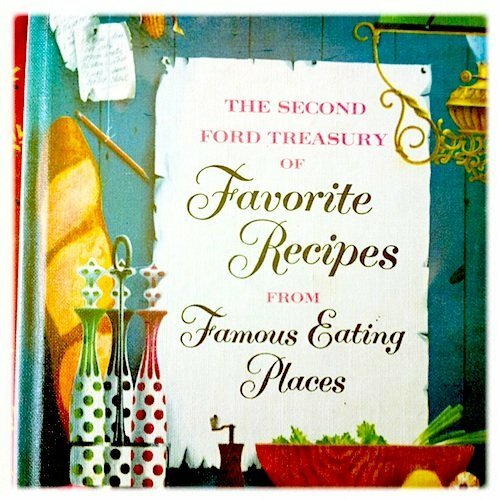 Our new cookbook The Second Ford Treasury of Favorite Recipes from Favorite Eating Places, is the second book in the series and was first published in 1954….hmm my first thoughts were that cookbook really isn’t very old…. sigh, especially with I was born in 1953. 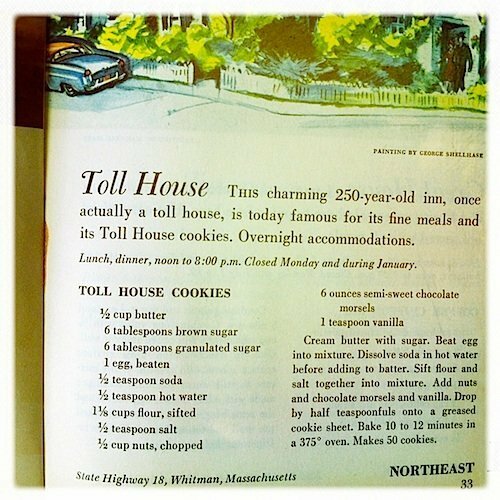 Our first recipe redo would be a classic cookie, the one and only Tollhouse cookie from its birthplace, the Toll House Inn in Whitman Massachusetts. Sadly the Toll House Restaurant is no more, having burned down in 1984, while there is a plaque on the original site, there is now also a Wendy’s and a Walgreen’s, what a sad testament to progress. The rules of the swap are pretty simple, change at least three things about the original recipe and redo it as a more contemporary recipe. I thought about the toll house cookie in all its delicious glory and tried to remember the first time I had one, and you know I couldn’t remember! But what I did remember were the oatmeal cookies that my mother made for me while I was growing up, I remember how much I loved the raw batter and how I could eat a whole bowl without even bothering to bake them….sigh, I also remember that my mother would only let me devour raw cookie batter if it was made with butter, not the Crisco that sometimes took its place. So when it came time to redo this classic, I had to go with a classic of my own, My mother’s oatmeal cookies. I wanted these cookies to have a little more substance to them, and honestly, raisins just didn’t seem to be enough. I had bought a bag of trail mix on a whim and decided that it would make a great addition to my favorite cookie. If you like my oatmeal granola cookies, make sure to try my Meyer Lemon Ricotta Cookies. 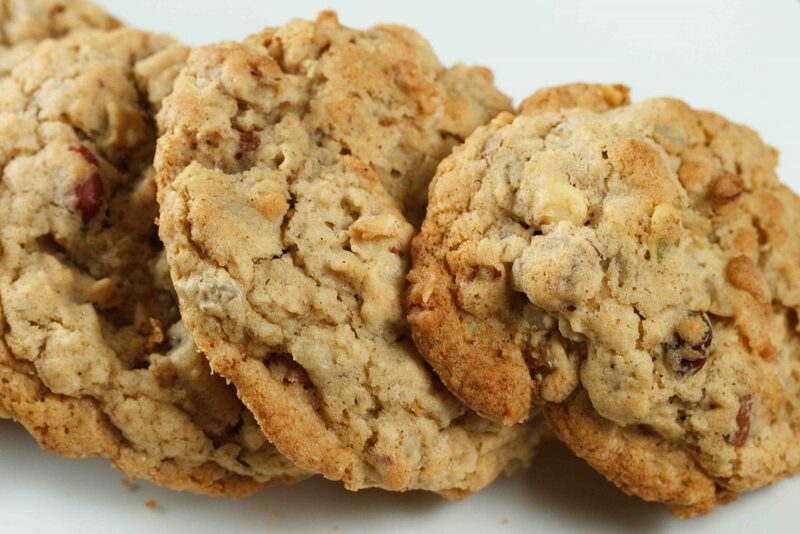 If you’ve tried my Oatmeal Granola Cookies recipe or any other recipe on askchefdennis.com please don’t forget to rate the recipe and let me know where you found it in the comments below, I love hearing from you! Slowly add your powdered ingredients to your creamed ingredients while mixing. *use the nuts of your choice just make sure to almost make them the consistency of flour by using your food processor. Big disappointment….Made these exactly and they are flat and too too sweet. Really the worst cookies I’ve ever made. I figured you left something out on purpose, but read other comments and no one complained. Not sure what went wrong. I re-read just to make sure I copied it correctly and I did. Hmmm, smh. sorry they didn’t work for you Abbie, its possible the butter was not cold enough when you creamed it with the sugar, that would cause them to be flat. Dough can be chilled before baking as well to help them from going flat. Dough could also be over mixed. I love how we both went with family recipes – great job! These cookies look wonderful!!! Love your recipes and BLOG!!! This sounds like a fantastic cookie Dennis! You can’t beat a “grandma recipe”! Mmmm, I love chewy, oatmeal-y cookies! And trail mix seems like such a great addition to any cookie. Great looking recipe, can’t wait to try it! I am such a nut for cookies lately (’tis the season!) and I LOVE the idea of “trail mix” cookies!! Chef Dennis you are a genius! I have shared you with all of my friends. These look so good. 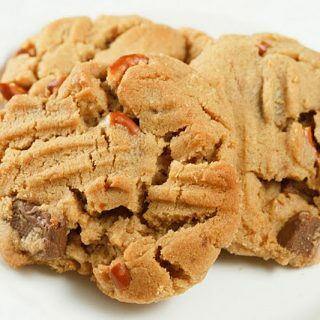 This is exactly the type of cookie I like to have for breakfast with a cup of coffee! Bravo Chef Dennis. P.S. Congratulations on Top 9 with these! Chef Dennis, I’m still smiling over your “sigh” re: the 50’s… I’m not too far behind ya! (Pre-1960 by a couple of years…) Take heart — “vintage” is used to describe a lot of marvelous things: wine, cars, and clothes that never go out of style — we’re in good company. 🙂 Great re-make of a classic cookie! I am picturing myself enjoying these cookies with a big tall glass of milk! yum! I like raisins in my oatmeal cookies, but I am positive that I would love these with trail mix even better! Those cookies look real good. The love for raw batter is what inspired me to do cookie dough truffles for this month. I love your interpretation because I love oatmeal cookies. And adding trail mix – that’s brilliant! I love oatmeal cookies…and therefore your redo 🙂 These look delicious! LOVE that you added trail mix to it…very creative! love it, i know i will love these, will let you know when I give them a try! been reading some of your last few posts to catch up, i love cranberry sauce on my turkey sandwiches, a real favorite of mine for sure, my grandmother has a snazzy cranberry sauce she makes that makes me go gaga every year….hoping you are doing well, and staying warm. blessings! Note to self: never come to Dennis’s blog when really hungry. It’s pure torture! 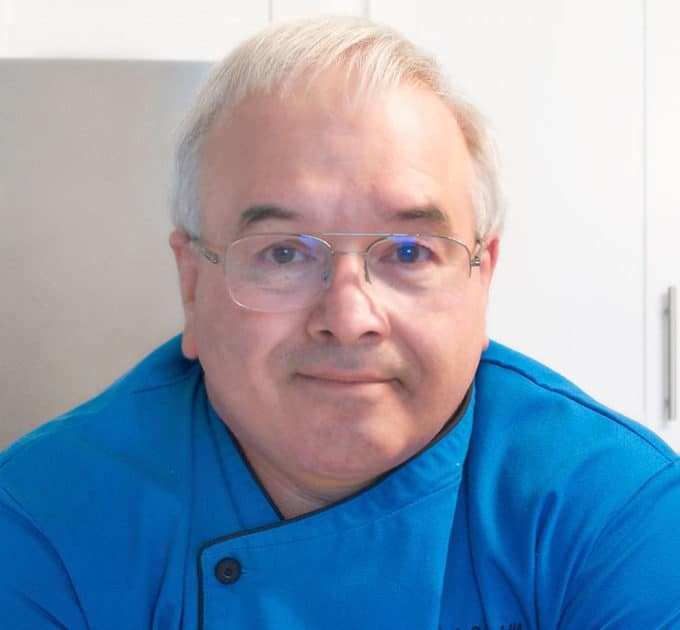 Hey Chef, hope all is well with you? Again you have given a recipe that my husband will love! I will definately make these to aid his recovery! 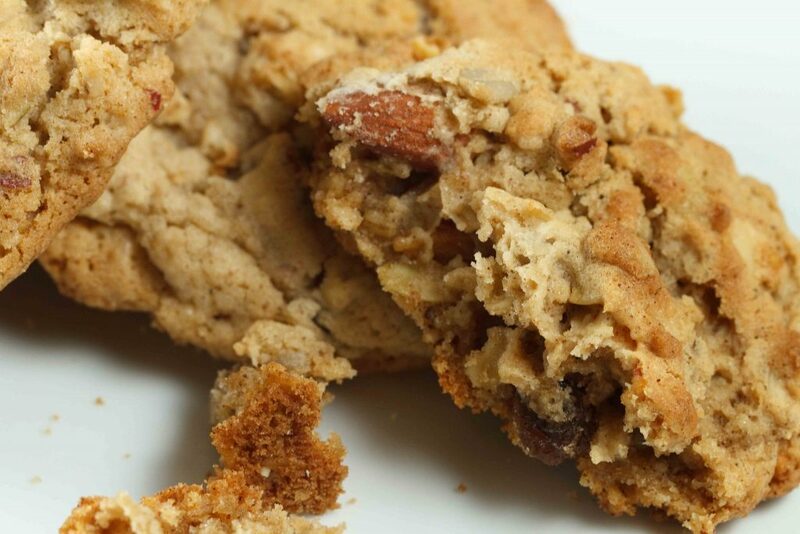 I love that you used your mother’s oatmeal cookies recipe, and I LOVE that you added trail mix to them. What a brilliant idea. I believe next month is your year anniversary with the swap – what a great year its been! Ooooh, I LOVE the idea of a trail mix cookie. Yours look absolutely perfect. 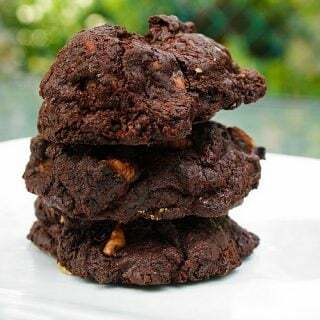 I am a huge fan of cookies like this – trail mix + cookie makes for a hearty snack that I’ll rationalize eating any time of day! It’s nice to have some oats and nuts to balance out all the sugar and butter! It’s so sad to hear that the Toll House is gone. I suppose that’s to be expected, though. It can live on in cookbooks and recipe swaps like this one! Nothing like the classics 🙂 These look wonderful. A Walmart and a Wendy’s instead of that gorgeous little house? How depressing. I’m glad we got to honor it in some way with this very young and fresh and hip recipe for the swap 🙂 Happy Holidays chef! These look so good! I grew up on the standard Toll House chocolate chip cookie. For many years, no matter how fancy the cookie, my favorite was still the original Toll House cookie on the back of the chocolate chips bag. I love what you did with the original recipe! I could easily eat a whole batch of those! Chef those cookies look incredible! Love your tasty photos..I wish I have them right here right now:))) Thanks for sharing, and have an amazing week! Chef..you made these so healthy 🙂 Clever of you to swap the semi sweet chocolate morsels to healthy oats. Thumbs up. Well done ! Dennis you really did a great job on this. I love that you went with trail mix. My sister would go crazy for this recipe. I must send her your link. I can just imagine myself hiking and stopping to snack on these. Not now as it’s flipping freezing out but once it’s warmed up a bit. Lol! 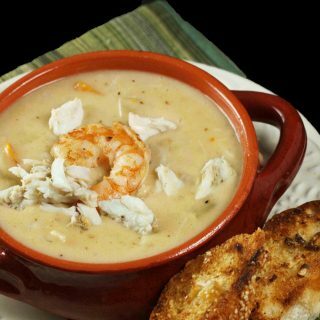 Great recipe and pictures. Beautiful photos Chef Dennis and I love the little help you sought out for your mother’s recipe; a bit of an omen I’d say in the blogger you chose for the inspiration. These look delicious and there is nothing like a good oatmeal cookie. A classic switch up for this classic cookies recipe. Fabulous as always my friend! I’ve loved an oatmeal chocolate chip recipe that my grandma gave me many years ago and I love granola. I’m good with putting the two together! I go a bit crazy over oatmeal cookies. I’m going to have to give these a try! You made me laugh when mentioning how awesome it is to eat cookie dough! I had a long conversation about that with a dear friend just last week. I feel like I’ve had cookie dough and frosting for dinner a lot lately with all of this holiday baking. 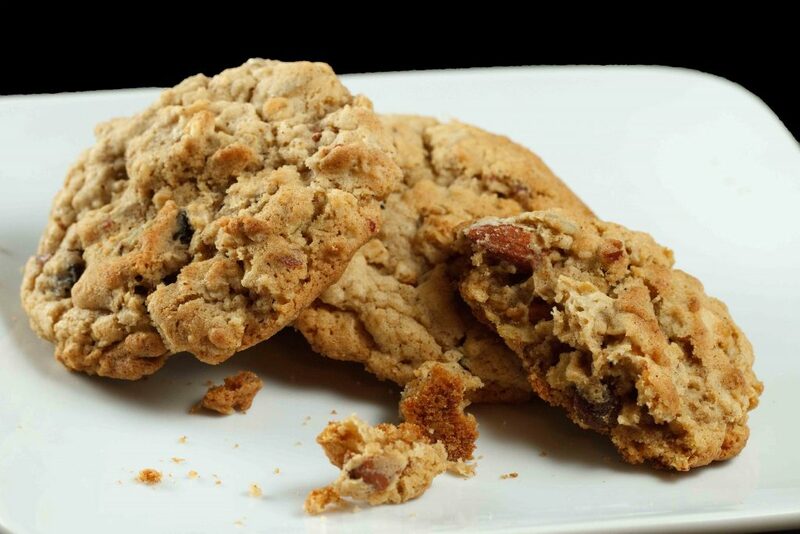 What a great idea to use trail mix in an oatmeal cookie. I have a mix that I love to make, and will now try to incorporate it into a cookie thanks to your creative post. Glad to have joined this swap group! I just want to take a bite of that corner of the cookie with the almond sticking out! What a great idea to use trail mix in the cookie…gives a whole new meaning to a ‘breakfast cookie’ 🙂 I will have to test this out! Hmm…. these look like they would keep well… on the trail!!! I’m going to try this to take along with me for my next backpacking trip. Thanks, Dennis, as always, for participating in the swap and I always look forward to your amazing recipes, and stories. These look wonderful, I love how they have some volume! Thick cookies are my favorite 🙂 I also think the finely processed walnuts would taste so wonderful. Can’t wait to try these out, pinned! 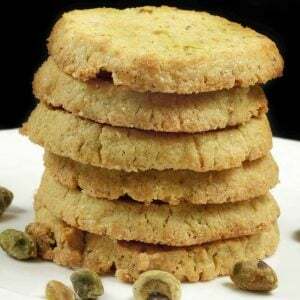 I am sure it would have been really fun swapping the cookie recipe ingredients with your mother’s classic.They look crunchy as well as chewy. Fantastic cookie! I love these vintage recipes, Chef Dennis! That’s a terrific-looking cookie, Dennis! What are the ingredients in the trail mix you got? I’m assuming it includes chocolate. Is that right? you know I never thought about what was in it, it was a store made trail mix at wegman’s, I do think it had some chocolate in it, but not very much, I almost added chocolate chips to it. it was mostly nuts, fruit, and little nibbly things. 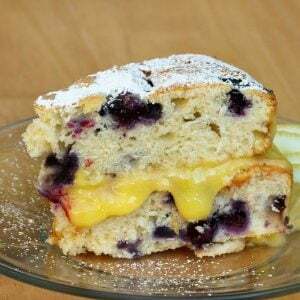 Very good recipe. Made 1/2 of ingredients and added granola. Cruspy and good consistency. Needed 5 more minutes cooking.